- Your next destination, Madain Sari, is a short trip north of the exit from Mountain Path. 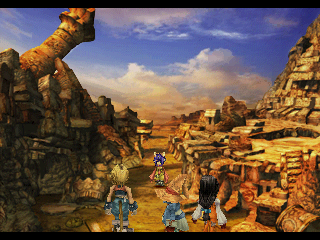 You'll hit a cut scene upon entering, and once it's done Zidane can wander around a bit. You'll get an ATE, Vivi's Feelings, and after looking one screen over and returning to the central fountain the game jumps to Eiko. Once it's done you can look around more thoroughly, receiving the Dagger's Feelings ATE in the process. - Check the rear of the fountain for the Libra Stellazzio, and just south of the fountain for a half-hidden chest containing a Tent. Check one screen north of the fountain and speak to the Moogle here to get a rather hilarious scene with Quina. - That done, head west from the fountain to find a scene with Vivi, and try to enter the building here to speak to a Moogle. 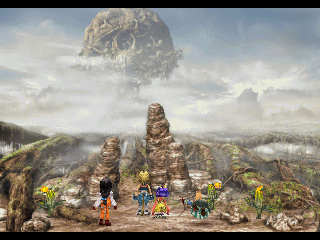 The Moogle will usher you to the place where you saw Quina, north of the fountain. This leads to the Eidolon Wall, which has storyline implications. You'll find Dagger near the entrance when prompted to go looking for her. - On the way to the Eidolon Wall you'll get the Eiko's Kitchen ATE, and, later, Eiko's Kitchen 2. This is part of a small mini game where Eiko tries to impress Zidane by preparing a delicious meal. During this part of the game you need to choose how many people to cook for; for the best results, go with eleven. Do not include the Oglop when prompted, and, when your fisherman Moogle asks for help, send Eiko over. Last, during the second ATE, ask Quina for advice. - Head to the kitchen in the west after visiting the Eidolon Wall to trigger a dining scene. 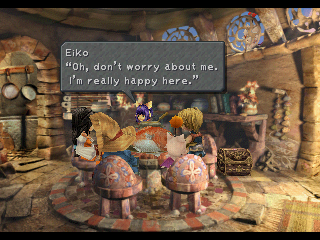 Depending on how well Eiko cooked the scene will last longer, and you'll receive additional information on Summoners. Sticking the Oglop in the meal also has interesting results. Once the meal is over you can grab an Ore from the chest in the dining room. There's a Phoenix Pinion on the other side of the table, as well, beside Dagger. - Grab the stew pot from the table and take it to Eiko in the kitchen. Check beside the table on the left side of the kitchen for a Kirman Coffee. Talk to Eiko until her responses begin to repeat, then head out of the building. A Moogle will offer to let you rest. The next morning the party will reform, and you'll have a new destination: the Iifa Tree. Note that you can speak to Morrison, the Moogle near the entrance of Madain Sari, for some vending services. - Head back to the Conde Petie Mountain Path and return to the screen where you fought your last boss battle. You'll be at a crossroads. This time, go north. The Iifa Tree is within easy sight once you're back on the world map. After a cut scene you'll receive a Ruby. - Proceed along the Iifa Tree's roots until you're inside the massive structure. A Moogle, Mocchi, is waiting inside. You may have a letter for Mocchi from Mogryo. Beyond the Moogle is a cut scene, and the subsequent transporting platform will take you down a level. - Wander along the downward pathway beyond the platform until you reach a second screen, and a minor split in the path. Just south of it is another, smaller split with a hidden lever to pull. Doing so will bring a Phoenix Down out for you to grab. Head south from here and you'll find a Hi-Potion in the bottom-left corner of the screen. - The descent continues onto another screen. After the first spiral to the left in the path you can find a hidden switch on the left side of the screen; this makes a chest containing a Healing Rod appear on the previous screen. As you wind along the lower path again you'll find a small doorway on your right; inside is an Ether. As the path winds south and splits again you can find a chest containing a Lamia's Flute. Barely visible, to the left of this chest, is another chest containing a Remedy. - To the south is a cut scene and a lift that will take you far, far below. Two battles and some exposition follow, and at the bottom you'll wind up on an enormous harp-like structure. At the bottom of the second set of stairs, on the far right, you can find an Elixir, and just behind the left side of the central pillar atop the harp, hidden, is a Brigandine. Check the far left side of the harp for a cut scene, then run up to Dagger once the music changes to get into a battle. 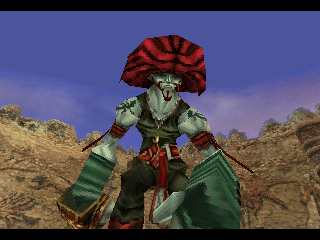 The fact that it explains much of Final Fantasy IX's plot aside, Soulcage is a relatively tough opponent. It likes to use AOE attacks on your whole party, from the relatively harmless Leaf Blades and Shockwave to the potentially-lethal Lvl. 5 Death, as well as Mustard Bomb, which will inflict heat status on one character and immediately kill them if they try to use an action. Not that painful, overall, though if you try to exploit Soulcage's obvious weakness to fire it will become more aggressive and start using Flame Blades, an AOE attack that does hurt. Blizzara will put this out if you use Fira accidentally. Soulcage can use Fira itself, an attack that's pretty painful, though Firas seem rather rare. Fight it more or less normally. Soulcage is undead, and healing moves like Cura will damage it. 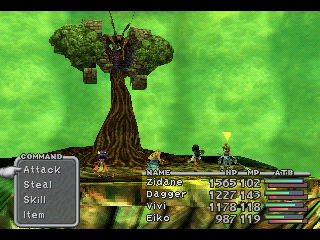 Dagger and Eiko can go on the offensive, pummelling the thing with Curas until it folds. Leave Vivi on healing duty unless you have Bio. Zidane, as ever, attacks. Fight it the easy way. Because Soulcage is undead it's vulnerable to Life and Phoenix Down. Life kills it in one hit; Phoenix Down kills it in one plus a single tap from any character. Easy peasy. Zidane can Steal an Oak Staff, a Magician Cloak, and a Brigandine from Soulcage. - After the events of the Iifa Tree Eiko will get called back to Madain Sari. Head back that way and check the kitchen to find a secret room, inaccessible before. You can find a Survival Vest and a Phoenix Down inside. Head towards the Eidolon Wall - Morrison can heal you - and peek inside. A Moogle will grab an Exploda and an Elixir for you after doing so. Charge in when you're ready. Well that was abrupt. Scarlet Hair fights Zidane alone, but it's not a difficult battle if you've kept up with your levelling. All he does is leap around the battlefield and increase his evasion, jumping back to his starting point to deal attacks. Once he's in front of Zidane again his evasion returns to normal. Smack him when he's close up and heal with Hi-Potions whenever Scarlet Hair leaps away. You can also equip Counter on Zidane prior to the battle to smack him back whenever Scarlet Hair leaps in to strike. All in all, pretty easy. Zidane can Steal an Ether and Poison Knuckles from Scarlet Hair. - Once the battle is through the red-haired dude will run off. Head back to the kitchen storage room and Eiko will give you a Memory Earring. Dagger will leave; follow her, then, just outside the dining room, look around for a question mark prompt. This will trigger a long series of cut scenes, at the end of which you'll leave Madain Sari - and gain a new party member, default name Amarant. You need to choose a party of your five members at this point, and swapping in Amarant for either Dagger or Eiko is recommended. Speak to Morrison at Madain Sari if you want to change again. Shortly after Dagger runs off you can find a Moogle, Mocchi, a quick walk to the north. He's hidden behind a wall. Mocchi has a letter from Stiltzkin. At the end of the trek you'll get an Aquamarine. Beyond that there's not much to this section besides storyline and cool FMVs, and when it's done you'll be back in Alexandria, minus one major antagonist.